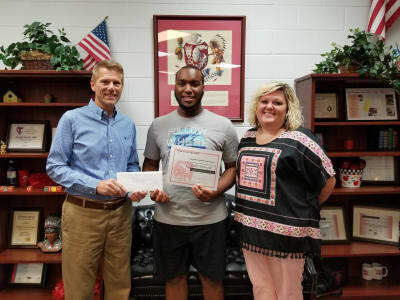 "Often seen suited up in his Indian costume, cheering for his home team, Zalin Dennard, Dodge County Senior has been awarded the Tribe Scribe and Eastman-Dodge County Chamber of Commerce Student of the Month for September. Dennard is currently the president of Student Council, a leader of both Spirit Club and Fellowship of Christian Athletes (FCA). He's also involved in Girls and Guys for Christ and Math Club. Zalin attends Plainfield Baptist Church. Some of Dennard's hobbies include eating and watching NCIS. After high school he plans to attend Middle Georgia State University for two years and then transfer to Columbus State University, where he plans to major in mathematics and educational leadership. His ultimate goal is to become President of the United States. Zalin was nominated by Mrs. Darci Rogers, his yearbook advisor. This summer he attended a leadership camp and when he came back to Dodge County High School, he organized the overnight camp for the entire student council group. During the camp, Dennard lead sessions, played games, and gave a great example of "what a true leader is." "As Student Council President, Zalin has worked tirelessly to motivate our group," Rogers said. He is always willing to do whatever is asked of him and always goes above and beyond to get it done!" Zalin is the son of Michael and Cerquera Dennard and has two sisters, Faith and Heaven. "